Taste test: These are your standard narrow-rippled potato chips, with plenty of potato taste and a good amount of salt. A good chip. 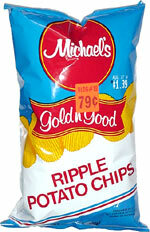 Smell test: The usual smell of ripple chips. Salty and good. Company: Michael's Distributing Co., Inc. This snack was discovered by Jeremy at Building 19. Review published .